"Even in the wider evangelical portion of conservative Protestantism there are emerging divergent perspectives on reading Gen 1&-2. To some this is salutary. To others it is a slippery slope. The essays to follow in this volume, all by highly esteemed and well-published OT evangelical scholars, will demonstrate this hermeneutical diversity . . .
A community of believers tries, by the guidance of the Holy Spirit, to come to an understanding of a scriptural position or passage by thinking together, talking and dialoguing together, praying together, and by agreeing to disagree agreeably if the case need be. The title of the Bryan Institute symposium which produced this collection of essays was &'Reading Genesis 1&-2: An Evangelical Conversation.&' To which I say, let the conversation continue." 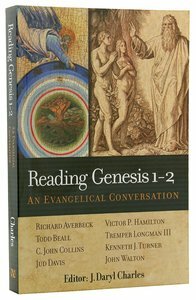 About "Reading Genesis 1-2: An Evangelical Conversation"
Customer Reviews For "Reading Genesis 1-2: An Evangelical Conversation"
I write the follow review from a confessional reformed perspective. The book is based on a symposium that was held at a Christian college in America to discuss the creation accounts of Genesis. All contributors came from American evangelical instituitions many experts in their OT studies. The book is organised according to a multiple view format where each author contributes an essay and then all the other authors critique it, with a final response to the critiques by each author. Because all the authors are primarily biblical scholars they approach the subject of Genesis 1-2 from a literary, linguistic, theological perspective no detailed interaction with the natural sciences or the history of interpretation from past authors. In this way the interested will get a good insght into where the evangelical world is presently with this thowny subject. I recomend it to anyone prepared to be challenged for it will require the average reader to get into the weeds, which is not everyones cup of tea. I benefited from some good insights, but didn't rock my world!